Sitting in Northcote's Palomino cafe I found a certain uniformity in its kitout that brought lots of useful descriptors to minds. It's interior is slabby (note, not shabby! ): rectangles and right angles make up the bulk of the fittings. Tucked in the back corner is a large, solid communal table with benches on three sides; around the sides of the cafe sharply right-angled laminated tables jut from the walls. Even the front door is recessed in a blocky square. Crowning the front door is a potted fern. Touches like that, as well as the curved, fan-print-wallpapered bar, break up the blockiness. Similarly, geometric shelves house cute ceramics and far less linear samples of bottled drinks for sale. A deep navy feature wall behind the counter absorbs some of the light from the windows stretching across the full shop width. Palomino does a strong line in pides (of the foccacia style, rather than than turkish pizza style), mixing and matching classic ingredients like salami, spinach leaves, pumpkin, feta, etc. 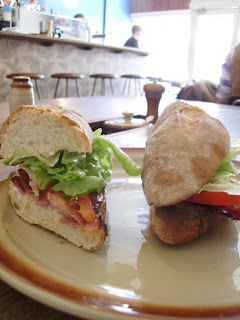 They've also made a subtle but effective change to the BLT: here it's a PLT, with prosciutto standing in for the bacon. It arrives looking deceptively straightforward, all too readily dispaying its fillings as the top piece of bread toppled onto the plate. But taken slowly, it had a lot to give. Proscuitto offers a sweeter filling than bacon, with that caramelly flavour reminiscent of onions on a steak sandwich. Closer inspection of the bread's inner-side revealed a judicious smear of mayonnaise, though a thinner, darker sauce also dripped during consumption - perhaps a little hit of chutney? And take it slowly I did, as I wanted time to ponder the entity that is the inner-north Melbourne cafe. Having visited Small Block the previous day, and La Paloma the week before, I'd spent some time pondering adjectives, and found myself re-living the process of writing about any number of local places, commenting on the exposed concrete floors; walls either shabbily unpainted or touched up with kooky decoration; mismatched, reclaimed furniture. 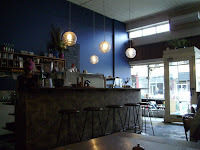 Each cafe strives for some individuality, normally through their menu (Palomino, for example, offers 'eggs in their shell' - ie boiled), and while they are removed from mainstream homogeneity, there are marked similarities between so many of the venues in the Brunswick-North Carlton-Northcote rectangle. Is that a bad thing? The model is one that many cafe devotees thrive on, and the ubiquitous success of every cafe that's opened on Lygon St just in the time I've lived here is testament to the fact that there's a call for it. Are we on the cusp, however, of alternative becoming mainstream? Or, are we blessed to have so many places in easy reach who save money on aesthetics so that they can offer their clientele better coffee and produce? I'm inclined to think that it's more the latter than the former, but every market has a saturation point, and for purists it's better to back away and think about innovation before that point is reached. We go there a lot, mainly as it's our nearest cafe (and the coffee is the best in Northcote) but sometimes the staff can give you the distinct impression that they're doing you a favour by being there. It seems to be another element in the Brunswick Model - the surly service. I like that you mention it as your nearest cafe - one of the great things about all these places is that they give each neighbourhood a local to head to (their suburban/ex milk bar/corner store locations being yet another unifier). I like the look of your site too - some worthwhile information to take advantage of. The menu is diverse enough for everyone and the coffee is fantastic. Best coffee in Northcote. I'm a gluten free eater so when they offered to do any of their breakfast dishes on a pesto polenta, i was stoked. Its changed a lot since the previous comments. New owners, friendly staff, consistently good coffee. Thanks for your comments - it's always great when you find a place with consistently excellent coffee! That pesto polenta must be a god-send (and it sounds rather lovely). I'd love to hear of any other places you've found that do good meals for gluten-free eaters. Thanks for the tip on GF Breakys Anonymous. I went there on the weekend and it was great to find somewhere that had lots of GF options. Coffee and service were great too.